I have a bunch of speculative shares which I affectionately call "the minions". The characteristics of the minions are: small speculative positions in loss-making companies with reasonable chance of turning around. The idea behind the minions came about from a realisation that one source of multi-baggers is loss-making companies that manage to turn around. You can refer to How to Get a Multi-Bagger? for more info. The turnaround multi-bagger I had was Magnecomp, now known as Innotek. It was a chance occurrence because I usually avoid loss-making companies. However, one of the main problems with value investors is that we often buy too early into companies whose share prices are falling but the earnings are still good, without realising that earnings would soon follow the share prices down. 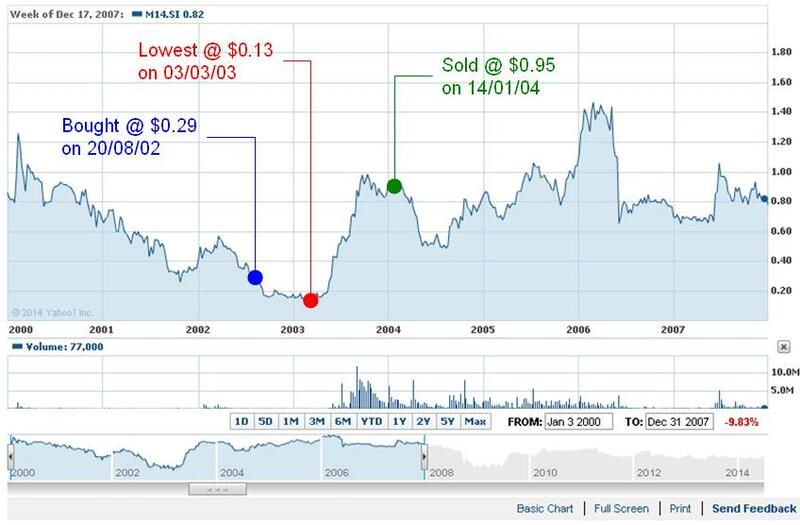 In the case of Magnecomp, it reported a huge loss after I bought it and the share price continued to fall. At its lowest point, the unrealised loss on my purchase was as high as 55%. Subsequently, it managed to turn around and I sold it for a 3-bagger. See the price performance of Magnecomp below. This multi-bagger is the only turnaround multi-bagger that I have. Due to my preference for profitable companies, it did not occur to me that even loss-making companies could be profitable investments! It was only when I blogged about it in 2014 that I began to seriously consider adding loss-making companies with reasonable chance of turning around to my portfolio. To manage the risk, the amount of money invested in them is relatively small, typical 1/3 the size of a typical investment in a profitable company. Not only that, the amount invested is mentally written off the moment they are purchased. Thus, there are no expectations of them returning an investment profit. In other words, there is nothing to lose on them. Despite the fact that the amount invested is 100% written off mentally, these minions, as a group so far, have performed beyond expectations! Of the 11 minions, 2 were sold off at profits of 34% to 87% and 2 are unrealised multi-baggers! See the table below for the performance of these minions to-date. In fact, MIT (Manufacturing Integration Technology) went as high as $0.285, representing a 4-bagger on my original purchase price of $0.066! However, since it was considered a nothing-to-lose speculation, I held out for bigger gains. Unfortunately, it has come down to $0.165, with further drop likely. The advantages of the minions go beyond returning a profit on the investment. They also serve as incubators for further investment, which is why you seen some minions have twice the amount invested in them. As the probability of turning around increases, a second investment is made, so as to reap bigger gains when the turnaround is realised. The best example of this is MIT, in which a second investment was made at $0.13, even though it had already doubled from the original price of $0.066. The second advantage of the minions is that they are considered nothing-to-lose. Since there is already nothing to lose on them, it also means that they are technically "risk-free". This characteristic is very useful in making investments in high risk sectors, such as the Oil & Gas industry. From the list above, 4 of them are from this industry and they have performed admirably. When something extremely risky meets a nothing-to-lose mentality, the risk-reward balance tilts in favour of the latter. Minions are a key part of My Oil & Gas Fightback. It is important to note that the minion strategy works only if the position is small enough to be written off. If it is too large, it is difficult to write off the full amount and adopt the nothing-to-lose mentality. Not only that, there is usually a need to diversify as much as possible to reduce the risk of individual stocks really losing money. However, this also presents one of the challenges of adopting the minion strategy. While $1,000 in 1 stock might be easy to write off, a total of say, $10,000 in 10 stocks might not be that easy to write off. Moverover, although I talked about writing off the investment, nobody likes to really lose money. Thus, stocks selected under this strategy have some evidence of being able to turn around. If they have no chance of turning around, using this strategy will only mean losing more money. In conclusion, minions may be small, but do not underestimate them. It is precisely because they are small that they are able to achieve big returns!